The very first whisky review I ever wrote was about Glenmorangie's Original and Extra Matured expressions. I had stumbled upon the Discovery Pack, which contained a full bottle of the Original and miniature bottles of the EM whiskies. A good review from John Hansell and a reasonable price convinced me to take the plunge. The rest, as they say, is history (and an abundance of single malt in my liquor cabinet). So last summer when I noticed that 4x100 mL packs of the same whiskies were available for sale in Oregon, I snapped one up. I had been interested in re-tasting the whiskies to see how my palate had changed over the intervening year and a half. While they absolutely blew me away at first, I wasn't sure if I would hold them in the same esteem after trying dozens of other single malts since then. So I did a couple of tasting sessions - here are the results. Nose: very cleanly malty, honey and caramel, floral, jammy berries, vanilla, grain, sugar cookies. After adding a few drops of water, the sugar cookie dough becomes a bit more raw, more vanilla comes out, the floral notes become more grassy, and some grape fruitiness emerges. Taste: a sour citrus punch up front that fades towards the back, which slowly shifts towards honey sweet malt with sugar cookies, vanilla, and light oak, fading out with green floral notes, lemon peel and pith, cacao and coffee beans. After dilution, the palate becomes more integrated, with the sweetness fading more quickly into tannic oak and black pepper with a sour tinge. Bottled at 43%, this whisky makes a fantastic introduction to the world of single malt whisky, presenting its flavors clearly without being overwhelming. This one changed the least for me, retaining its pleasantly light and malty character. I could drink it just about any day of the week and be perfectly happy with my choice. Glenmorangie's spirit seems to excel with a light touch from ex-bourbon barrels, accenting the spirit without squashing the underlying spirit. I can understand why people might move on from this after getting a handle on the basic character of single malt whisky, but it's a lovely one to keep coming back to. Nose: heavy sherried fruit, vanilla, light nougat, bubblegum, almond skins, rather dry, dark chocolate, slightly savory oloroso notes, malt sweetness underneath struggling to get out, a little floral and funky. After adding a few drops of water, the malt got a bit more strength and became somewhat nutty, the sherry became more recognizably oloroso, it became more savory overall, and the nougat popped out more, and some mint emerged. Taste: moderately sweet with a little sourness up front, definite sherry presence, something nutty, then black pepper and oak tannins, a hint of chocolate at the back, and subtle floral malt underneath everything. After dilution, it became more integrated, with more balance between creamy malt and sherry sweetness, which fades into sherry/tannin bittersweetness, light creamy nougat, mint overtones, and pink bubblegum. Finish: savory oak tannins and dried fruit, with some floral malt, mint, and chocolate. It's a shame, but this whisky just feels out of kilter. The heavy blanket of sherry seems awkward, ill at ease with the lightly floral base malt. While the malt hasn't been completely smothered, it has to fight to make itself shine through. This seems contradictory to the Glenmorangie formula. I will admit that it gets a bit more balanced with water, though the nose loses so much intensity that it doesn't seem like a worthwhile trade-off. I think the ideal would be something more like Aberlour 12 Year - blending together ex-bourbon casks with ex-sherry casks to let each component shine while making a more harmonious whole. The cask finishing strategy is too heavy-handed for Glenmorangie's malt. More broadly, it's interesting to see how this has gone from being my favorite of the bunch to last in line. Nose: very rich, sweet wine notes over malt, lots of raspberries and blackberries, some cacao and cinnamon, floral around the edges. After adding a few drops of water, it becomes muted, with some creamy nougat, diffuse sweetness, fresh wood, more prominent cinnamon, malt, and berry compote. Taste: integrated port, berry, and malt notes with black pepper up front, bittersweet overall with a lot of creaminess, slides into bitter almonds, tannins, and a burst of red berries at the back alongside some cacao/chocolate. After dilution, it becomes thinner but creamier, with less well-defined flavors, the oak tannins and pepper notes become more prominent but get a certain mustiness, and the chocolate notes become a little artificial like chocolate sauce. Much like port wine itself, this is very much a dessert dram. Lots of berry sweetness, which is just held in check by pepper and oak. I feel like I have to be in the right mood to fully appreciate this one. While it hasn't completely overwritten the classic Glenmorangie malt and floral notes, the port cask comes in with a pretty heavy hand as well. Either using refill port casks or a bit less time might give it a more balanced and less cask-driven character, which I would be easier for me to appreciate. With all that said, the biggest flaw is how much it falls apart with water. I only add three drops and all of a sudden it's an incoherent mess. For being bottled at a very respectable 46%, it just drowns at the slightest provocation. Getting the most out of this whisky requires leaving it alone. Nose: wine, toasted French oak, sweet floral raisins, a hint of malt, honey, caramel, vanilla cream soda, wildflowers, and orange peel. After adding a few drops of water, there is much more floral malt, wine integrates and retreats a bit, gobs of vanilla come out, and there are cinnamon and French oak notes. Taste: citrus notes throughout, syrupy sweet up front, then big French oak spice in the middle, lots of underlying malt, light wine tannins at the back with bittersweet chocolate. After dilution, it becomes more integrated and bittersweet overall. "When vice becomes virtue..." This was my least favorite of the bunch the first time I tried these whiskies, because it didn't seem to offer much on top of the basic formula of the Original. Now that seems like a plus rather than a minus. Unlike the other finishes, the sauternes casks seem to augment the Glenmorangie template - malt, floral notes, and fruit - without overwhelming it. There are wine notes and it is noticeably sweeter than the original, but it doesn't go off the rails. I also really like what the French oak brings with it, though I'd be even happier with a straight new French oak cask finish minus the wine to get something like Glenlivet French Oak or Compass Box Spice Tree. I feel like that would more cleanly integrate with the spirit. To sum up, with the exception of the Original, my opinions have more or less flipped. Sherry is out, port is still somewhere in the middle, and sauternes is on top. Overall, I think the lesson is that I'm now less interested in wine casks being the dominant player in a whisky - I'd much rather they act as accents on the fundamental malt flavors. Hopefully I can come back to these again in another couple of years for another spot-check. Compass Box is one of the most innovative companies in the business today, weaving together whiskies from any number of different distilleries to create new blends and blended malts. I've looked at one of their lighter whiskies, Oak Cross, which displays both John Glaser's ability to blend single malts and his creative use of wood. Today I'm looking at another blended malt - Peat Monster - which is about 180º from the sweetness and light of Oak Cross. Peat Monster is put together from a blend of a number of different peated whiskies (no surprise there) from Caol Ila and Laphroaig on the island of Islay, Ledaig from the Island of Mull, and Ardmore in the Speyside region of the Highlands. All come from refill ex-bourbon casks, which means that the focus on the malt itself, rather than the influence from the oak. Each single malt brings different characteristics to the final product, but as the name suggests, the main goal is peat. As with all whiskies from Compass Box, this one is bottled without chill filtration or color and is water down only to 46%, which leaves it with plenty of punch. Nose: lots of green peat, wood ash, eucalyptus/tea tree oil, slightly sour, solvent-y, malty, some floral vanilla underneath, overripe fruit, savory notes, a hint of salt and toasted oak. After adding a few drops of water, it becomes a bit lighter, with the peat shifting firmly into an ashy rather than vegetal mode and integrating with the oak, it's more balanced with a bigger dose of malt and vanilla, plus some cinnamon and hay come out. Taste: sweet malt up front with a bit of vanilla, followed by a wave of black pepper and ashy/vegetal peat, with the malt returning at the end along with a bit of cinnamon. After dilution, it becomes less sweet and more savory, with the peat becoming all ashy and merging with the black pepper notes alongside more oak tannins. This one really does live up to its name. While the malt doesn't completely disappear and the characteristic vanilla of Compass Box whiskies from marrying the components in first-fill ex-bourbon casks is present, this really is all about the peat. While not as in your face as some peaty single malts, it doesn't feel as balanced as it could be. Maybe more time in the marrying casks or a bit of something with less peat to give it a bit more sweetness. Some of this can be achieved by adding water, but it still doesn't sit quite right with me. As Tim noted over at Scotch & Ice Cream, it's not bad, it's just not something that I would pick over any number of comparably priced peated single malts right now. 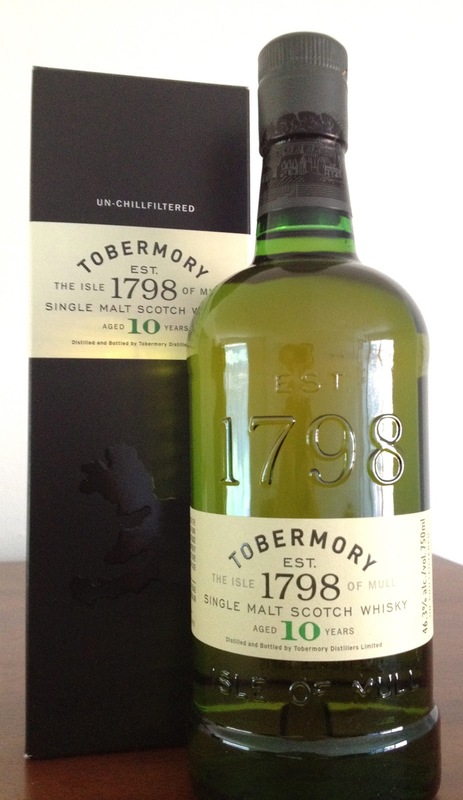 Tobermory is the only distillery on the Isle of Mull, located in the Inner Hebrides off the west coast of Scotland, directly across the Firth of Lorn from Oban, and north of the islands of Islay and Jura. The distillery was founded in 1798 (as is repeatedly pointed out in their new bottle designs), one of the few remaining distilleries that were opened before the 1823 Excise Act that legalized distilling. Originally known as Ledaig, the distillery had an extremely rough history before falling into the hands of Burn Stewart in the early 1990s. Since then things have been a bit more stable, including a recent major refresh of their whiskies, which are now all bottled at 46.3% ABV without chill filtration. To make things a little confusing, they sell two different single malts - their whisky made from unpeated malt is bottled as Tobermory and their whisky made from heavily peated malt is bottled as Ledaig (I've got a bottle of the 10 Year and will be reviewing it later). Nose: alcohol is noticeable, berries, floral vanilla perfume, fresh malt, toasted oak, green vegetation (peat, herbs, foliage, pine) and fruits (apples, pears), baking spices (cinnamon, nutmeg). After adding a few drops of water, it becomes a bit more savory, with malt and fruit dominating to produce sugar cookie notes plus the addition of a bit of coffee, chocolate, and something nutty. While I enjoyed this whisky, I feel like it comes with a few caveats. The largest is that it took a while for me to feel like it had a coherent direction. For being bottled at relatively high strength and being blended together from all first-fill bourbon casks, the flavors were surprisingly restrained at first. This was ameliorated with time - there was much more clear bourbon barrel influence after I had drained about half the bottle, so letting it sit for a while after popping the cork may help. But it wasn't a particularly compelling experience at the start, which made it hard to wade through to get to a point where it became more interesting. At this point, having just about drained the bottle, I would liken it to a bourbon barrel Glenfarclas - malt-driven, fruity and floral, but without the layer of sherry one finds in regular 'Farclas releases. If it had been like that to begin with, I would have absolutely no hesitation in recommending it. It has great balance and I appreciate the distillery sticking with nothing but ex-bourbon casks instead of fussing around with finishes. But the first half of the bottle felt like a bit of a slog getting to that point. So I will give it a provisional thumbs up. Probably worth seeing if you can try a dram at a bar first before springing for an entire bottle. As some of my regular readers may have noticed, I haven't been posting for about a month. Around the end of March I felt my motivation to keep up a regular posting schedule slacking. By the beginning of April I just gave up entirely. While I had plenty of things to say, the desire to get them written up just wasn't there. So I decided to take a break. It's been kind of liberating for the last month or so to focus on drinking because I felt like having a drink, rather than picking things with an eye towards cranking out enough posts. I took a few pictures of cocktails and then just took a pass on writing any tasting notes. They were, pretty much without exception, tasty cocktails that would have been good to share, but I just couldn't seem to be bothered. I've also been continuing my quest to knock down my stock of open bottles and have finally reached the point where I've made a pretty good dent in it. I even made it through an entire bottle of single malt whisky without writing a post, which was honestly kind of nice (and turned out to be for the better because the second half of the bottle was better than the first half). Because of all that, I shuffled around my liquor cabinet a bunch of fill up and make better use of the space. At the same time, I've been having some great conversations via social media. Twitter and Facebook continue to be full of people who enjoy talking about booze and I've happily dived into some extended conversations, which has mostly satisfied my desires. With all that said, I'm finally feeling the urge to start writing again. There are some good posts in the works that I'm looking forward to talking about. I think I'll start slow, but it feels like the right time to start flexing my writing muscles again.